China’s moves to ease mortgage restrictions and cut interest rates are bearing fruit in the nation’s smaller cities, where home prices have staged a recovery. Now comes the bigger challenge: Clearing a supply glut to spur investment by developers. Lower borrowing costs are helping a residential market recovery spread from the economic hubs such as Shanghai and Shenzhen to smaller and less-prosperous cities. New-home prices rose in September from August in more than half of the 70 major cities monitored by the government for the first time in 17 months. Yet, a construction boom over the past two years has led to 424.7 million square meters of unsold homes languishing nationwide as of Sept. 30. 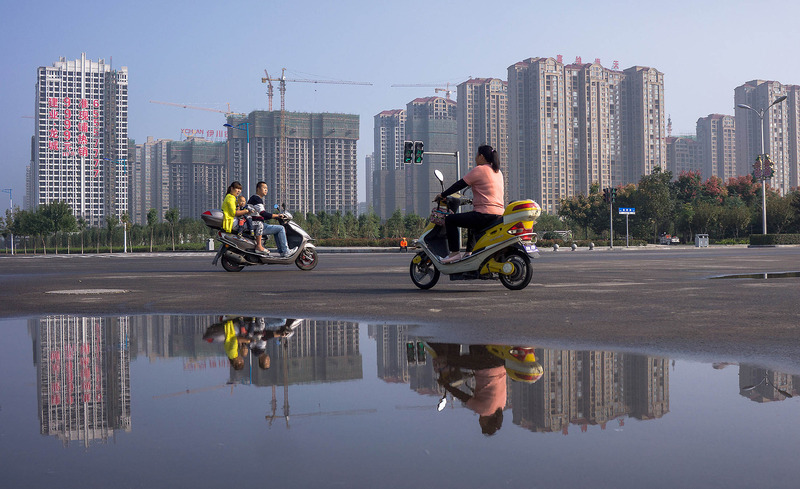 Reviving investment in real estate is crucial for the government, which on Friday stepped up monetary easing with its sixth interest-rate cut in a year and scrapped a ceiling on deposit rates as part of efforts by Premier Li Keqiang to find new engines of growth. China cut the deposit first-time homebuyers in smaller cities need to put down last month and is targeting oversupply-plagued cities that account for about 85 percent of sales nationwide, according to China International Capital Corp.
“The biggest factor damping the momentum in economic growth now is the slowdown in investment,” with property being the main hindrance, said Liu Xuezhi, a macroeconomic analyst at Bank of Communications Co. in Shanghai. “Although home prices have rebounded in first-tier cities, sales and investment in some second- and third-tier cities are still under pressure.” The real estate industry contributes almost 30 percent of gross domestic product, according to Nomura Holdings Inc. Authorities are seeking to bolster an economy that is forecast to grow at the slowest annual rate in a quarter century, as drivers of growth such as construction and manufacturing have stumbled. China cut the one-year lending rate to 4.35 percent from 4.6 percent effective Saturday, while the one-year deposit rate will fall to 1.5 percent from 1.75 percent. The People’s Bank of China also scrapped a deposit-rate ceiling that limited the rate banks could pay savers. China on Sept. 30 cut the mortgage down-payment requirement for first-time buyers in lower-tiered cities by 5 percentage points to 25 percent. The move followed a HOST of other easing measures. This year, the government also cut the down payment for first-time homebuyers borrowing from local housing providence funds to 20 percent, allowed developers to finance a bigger part of projects with borrowed money rather than their own capital, and eased restrictions on property purchases by foreigners. In March, it lowered the deposit for some second homes to 40 percent from 60 percent and exempted select homeowners from a home sales tax. Policies will likely need to be loosed further to help ease a widespread supply glut before developers have the incentives to boost spending on land and new construction, according to Mizuho Securities Asia Ltd. analyst Alan Jin. The construction boom since 2013 has led to a 13 percent increase in unsold homes in the year ended Sept. 30. China’s urban dwellers already own about 24 square meters of housing per capita, and the stockpile of new homes being built suggests that another 7 square meters could be added, bringing the average home ownership to 31 square meters, according to Nomura’s chief China economist Zhao Yang. That’s “very high” given China’s current level of economic development, and compares with 35 square meters per capita in Japan and 54 in the U.S., he said. For property to be able to underpin economic growth, the Chinese government will have to further cut rates and reduce transaction taxes, as the effects of previous loosening measures are abating, Ning Jingbian, a Beijing-based analyst at CICC, said in an interview before Friday’s announcement of the rate cut. China’s economy grew 6.9 percent in the third quarter of this year, the slowest quarterly expansion since 2009, the government said last week. The growth in fixed-asset investment slid to 10.3 percent in the first nine months, the lowest since 2000. Still, a 15 percent year-on-year increase in new property starts in September prompted some optimism about the investment outlook. The expansion, which reversed 10 months of declines, “suggests that some developers are turning positive on the sales outlook” for the next 12 to 18 months, Barclays Plc analysts led by Hong Kong-based Alvin Wong wrote in an Oct. 19 report. China’s aggressive easing measures are yielding other promising signs. Property agent Yue Lu noted an unexpected surge in potential buyers at two projects she was selling in the southwestern Chinese city of Chongqing during the National Day holiday early this month, after the latest cuts to mortgage down payments.